What do you ladies think (updated with chart)? I have a 29 day cycle and due to ov tomorrow or Saturday (days 15/16), which co-incided with my predictions on my FertilityFriend calendar. On Monday evening (day 11) I did a cheapie ov test and had a faint line on it and thought nothing of it thinking I have some LH in me getting ready for my ovary booting out this month's egg. Since monday, my temp's gone up from a steady baseline of 36.0 to 36.1 and for the past 2 days 36.2 and FF has put me down as ov-ing on Monday. The only CM was a clear not-quite EW on Tuesday. We did bd on tuesday pm and this morning anyway, thinking I'll be ov-ing tomorrow so was going to bd tomorrow and Saturday (and maybe Sunday if he's up to it!). come on ladies - 34 views!!!! Anyone have anything - even if it's just yea or nay? how many cycles have you been charting on FF? It's just that it says it uses predicted data until it has 2 cycles worth of data to go from so try not to worry too much! Also, even if you did OV on Monday, you managed to get a little baby making sesh on Tues night so you may have hit the jackpot there! thanks for your replies - it hadn't occured to me to post a copy of my chart on here! I had another temp raise this morning, so looks like definately ov'd earlier in the week. I could kick myself for dismissing the 2 faint lines on the opk's on Monday and Tuesday. Mrs R - FF has my menstural cycles in for the past 10 or 11 months now, but I've only been charting for one full cycle (this current one) and from just before ov last month, so FF is still using predicted data - I thought it'd use my menstural cycles too - my bad for not reading properly! The upside is that me and HB are still enjoying bd-ing every other day or so, so the SMEP may continue for another month! Thanks for the tip on creating a homepage on FF - much better than all the faffing I've been doing with screenshots! No worries about not being certain, no one can be, I think I just wanted someone to have a look and let me know what they think. 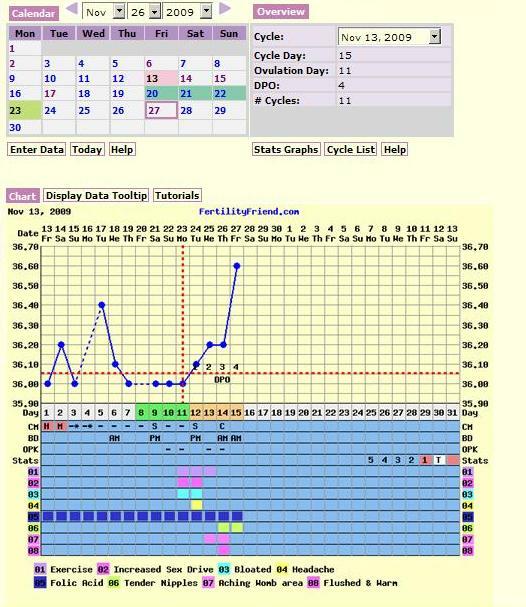 Looking at your chart I would go for cd14 as ov date to be fair, the reasoning behind that is the dramatic rise on CD15. But with only one temp cycle to go from it's quite difficult to be sure. Also the fact that you haven't had a + opk yet (as in second line same or darker colour than control) also throws a spanner in the works. Thanks lilylilac (lovely username by the way). I think this month I'm going to be obsessing over charting (last month it was ss - so at least an improvement!). Plus I suppose with only 1 real chart in FF, I can't rely on it too much. Agggr Arls, it is so frustrating trying to work it all out isn't it! I've been using opk's and I can't blimmin well get mine to work for me. Going by your chart you could have ov'ed 14th. I know sometimes it can change it's mind again once you've put more data in. I'm fairly relaxed about things this month now. I don't think we've made a bean, if I ov'd on 11th, then we didn't bd enough and if it was on 14th, then we did, but just got a feeling that we've not, which I'm ok about - it's only my 2nd cycle - 3rd time lucky I think! My temp dropped .2 of a degree this morning, so at least it's still high, so hopefully it'll change my chart accordingly in a couple of days. I've bought a CBFM from ebay so I'll start using that next month and maybe do the Sperm-Meets-Egg-Plan more to the letter, getting into the festive spirit and all that - I may get a naughty-elf costume!!! Was a bit down today as went baby knitting pattern/wool shopping with my mum for my sil and seeing all the lovely wools and jumpers and cardi's that my mum's doing and wishing they were for me. Good luck with your cycles and bd-ing ladies and thanks for your (continued) support.